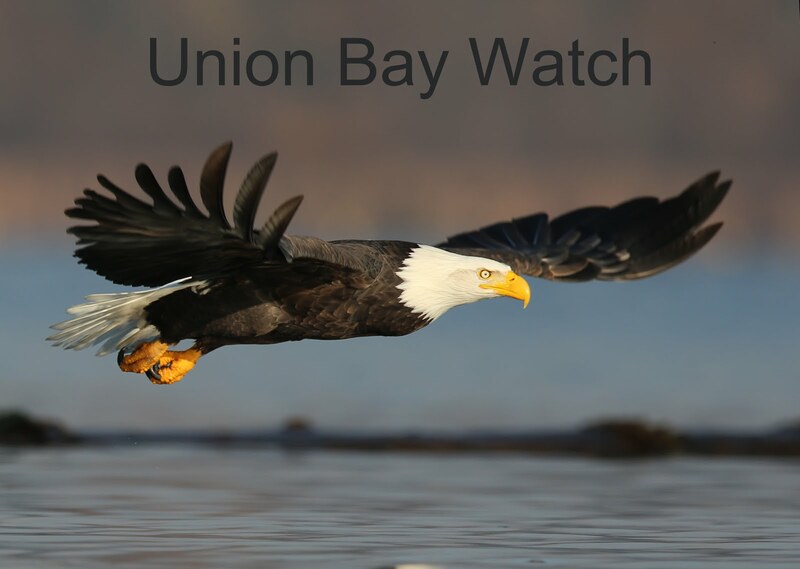 Union Bay Watch : Eaglets! Whenever I see Eva and Albert sitting calmly in their nesting tree, it creates an inner sense of peacefulness and bliss. For a moment, I feel as if all is right with the world. An aircraft gliding by reminds me of our ever-growing need for harmony with nature. I believe the first step towards harmony is paying attention. If you have ever watched or listened to musicians singing in harmony, you may have noticed the intensity of their effort, their focus on the rhythm and pitch of their partners. Working together, they produce music which is greater than the sum of their individual voices. By early March, Eva and Albert were spending more and more time around their Broadmoor nest. On March the 9th the behavior changed. 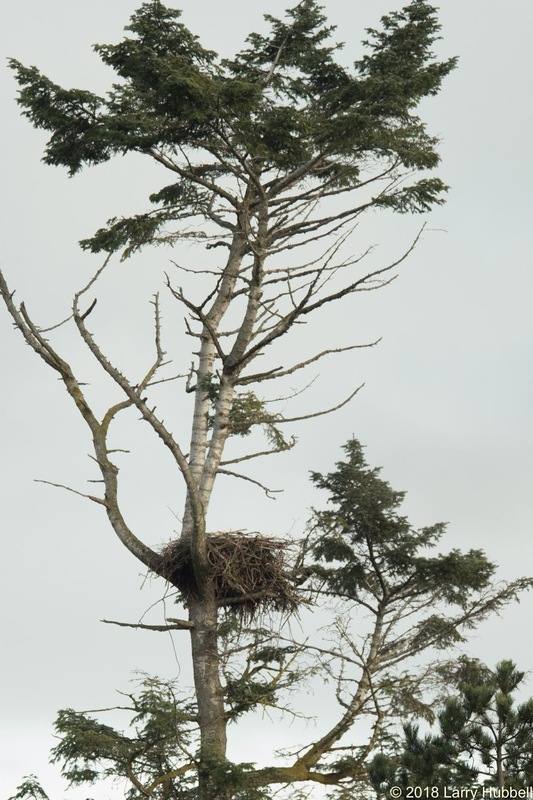 From this point forward, one of them was almost always sitting low in the nest. If you zoom in, you can just barely detect the upper half of an eagle head in the middle of the nest. This new routine made me think Eva had laid at least one egg and was beginning incubation. With approximately 35 days for incubation, the first egg should have hatched in mid-April. Initially, the eaglet or eaglets were too small and too weak to stand and be seen from the ground. 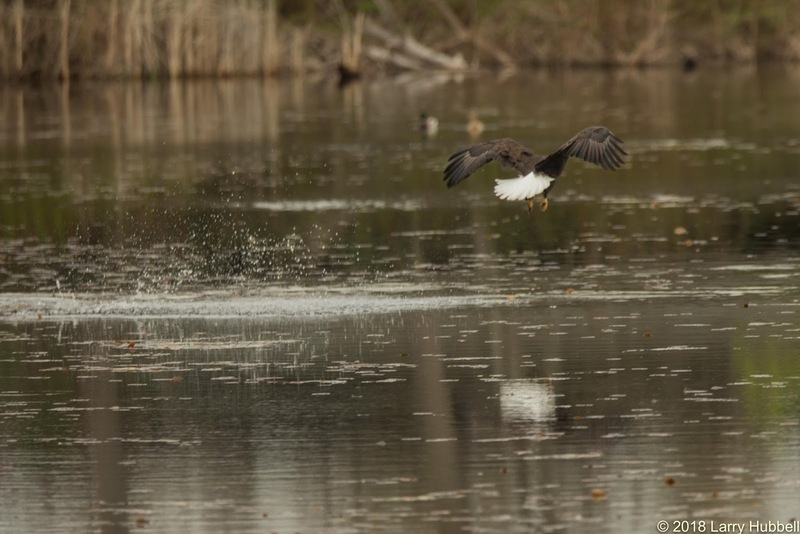 In mid-April, I watched one of the adults take a couple of passes at waterfowl in Duck Bay. The lucky ducks escaped. 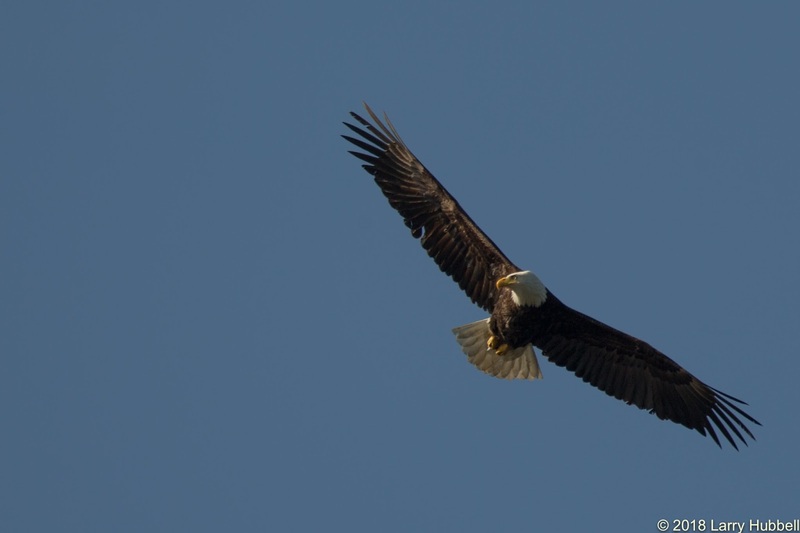 The eagle headed back in the direction of the Broadmoor nest. 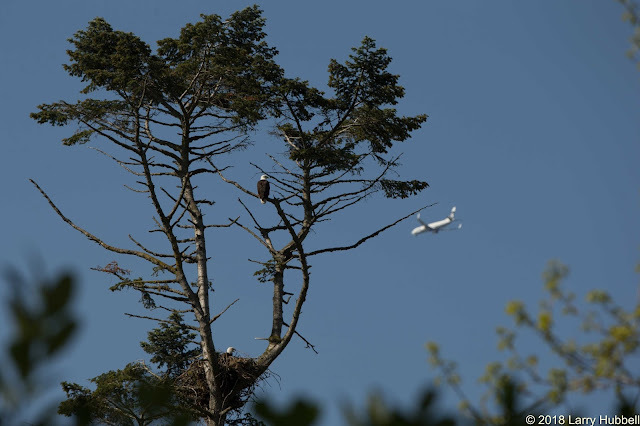 The eagle stopped to rest and preen just south of Foster Island. Whenever I see them by themselves, I always struggle to identify them. This bird was clearly in Eva and Albert's domain and apparently headed back towards the nest, but which one was it? 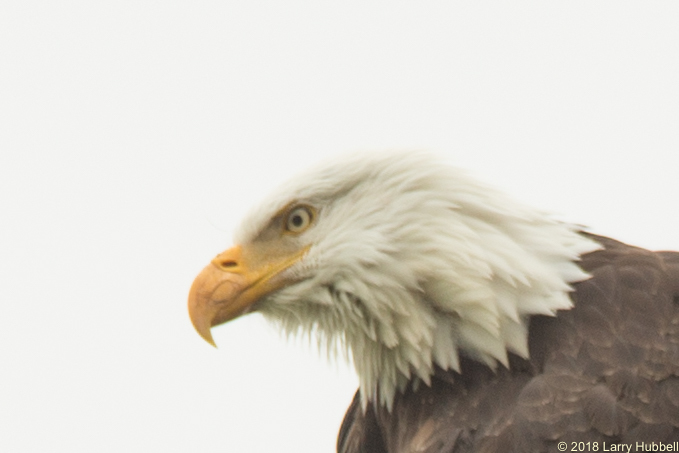 When I looked closely I was excited to see an oval marking on the left side of the eagle's bill - just below the nostril. I wondered if this was permanent. Would this mark be something I could use to uniquely identify this eagle in the future? The right side of the bill was unmarked. 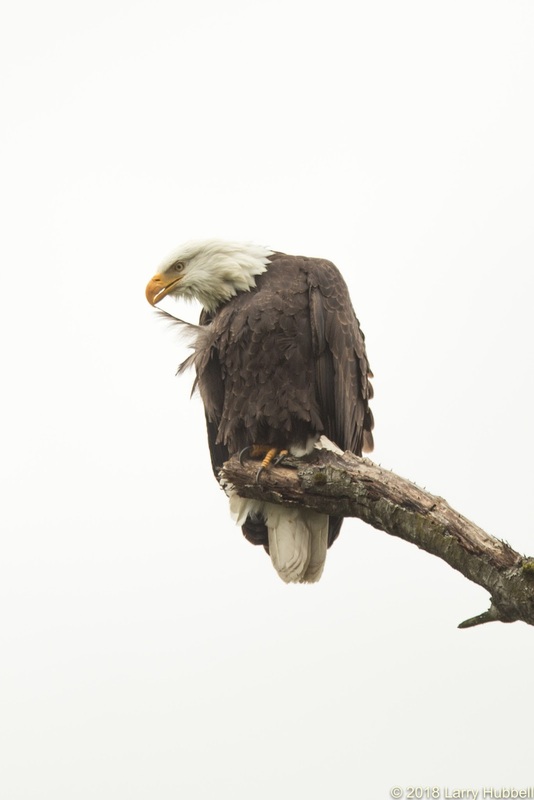 While we are on the subject of identifying eagles, during the last month I have noticed that Monty, the male from the new nest near Montlake Cut, is partially missing a feather on his right wing. I am not sure how long it will take for the feather to grow back. In the mean time, the gap is a useful means of identifying him. 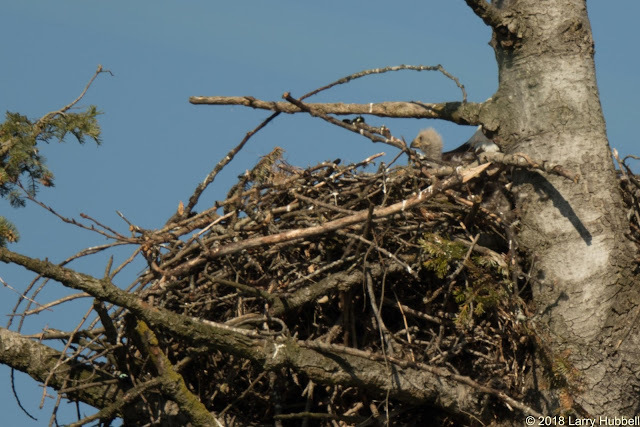 Needless to say, I have been watching Eva, Albert and their nest fairly closely. 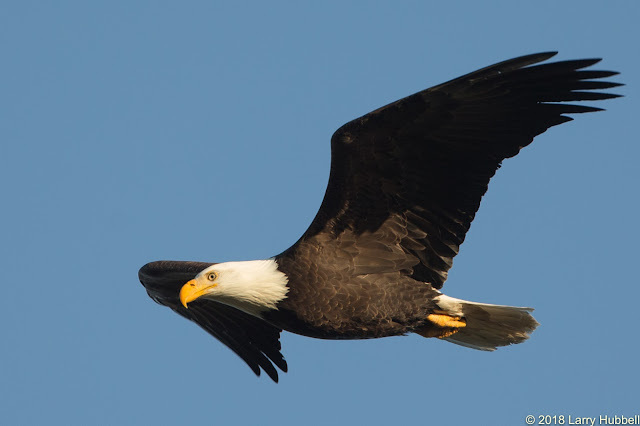 They are the pair which have been historically called, The 520 Eagles. Of course, with Monty and Marsha moving in along The Cut, they have new competition for the title. I have been observing feeding behavior which is encouraging. 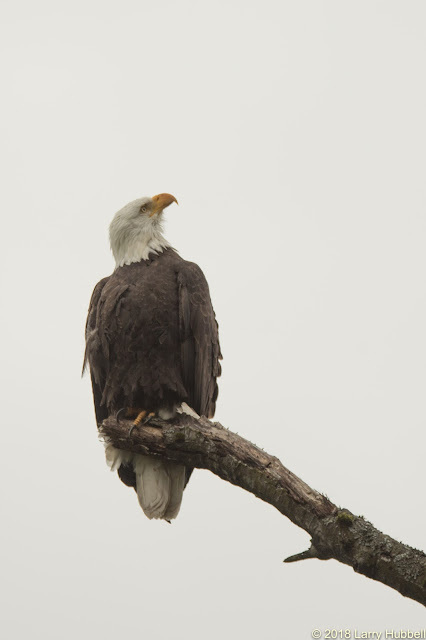 On the other hand, I have spent a fair amount of time without actually seeing any eaglets. Not only have I been looking for signs of their young in the nest, but I have also been watching for that unique mark on the left side of the bill. The distance involved has made discerning modest markings difficult. Although when Albert passed fairly close, it was obvious that the left side of his beak is unblemished. I am now hoping for another similar close encounter with Eva. 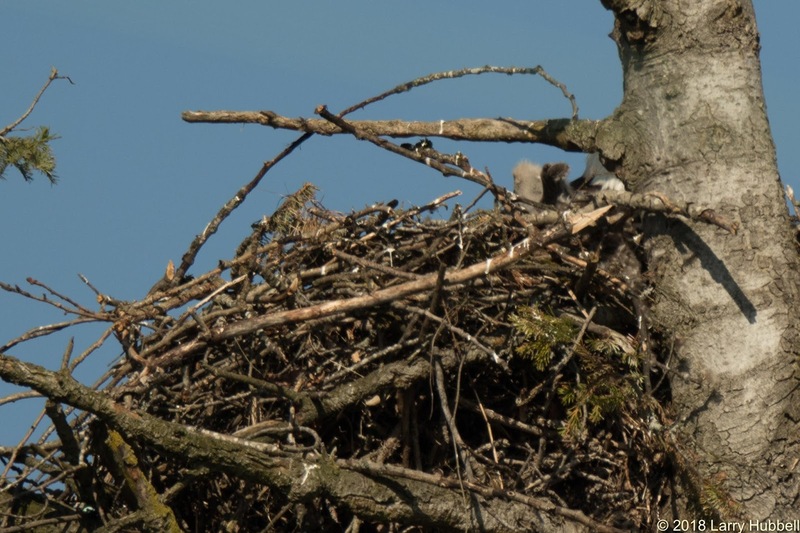 On Tuesday morning, I finally got my first look at one of Eva and Albert's new nestlings. The whitish natal down is replaced fairly quickly, so I am thinking this eaglet is less than 3 weeks old. On the other hand, it is standing up and alert so I suspect it is probably more than a week old. 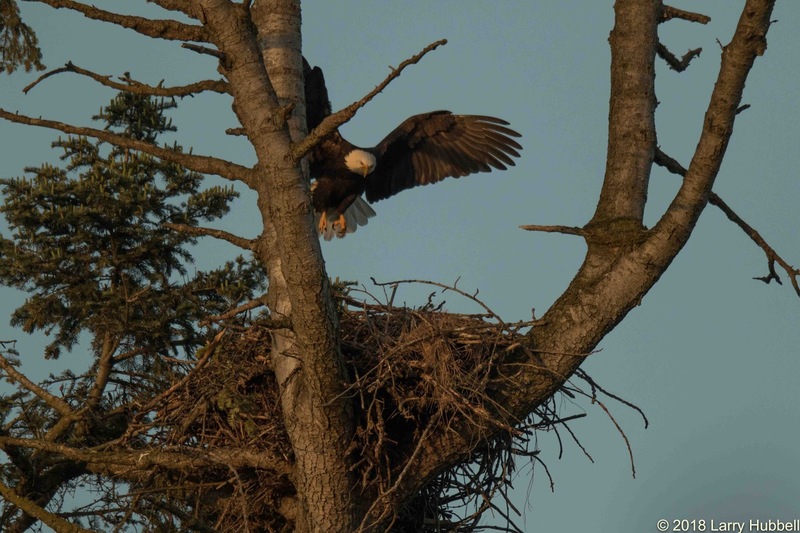 So far, I have not seen any other eaglets. 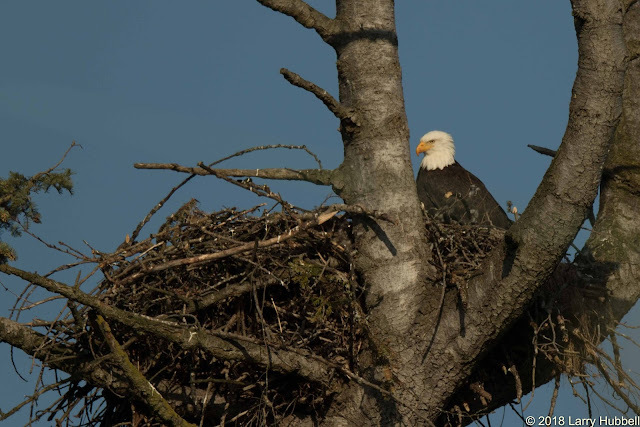 In years past, there have usually been two in the nest. I am guessing the little brown extremity in this photo is a wing. I think the nearly invisible buds are where the flight feathers will soon pop out. 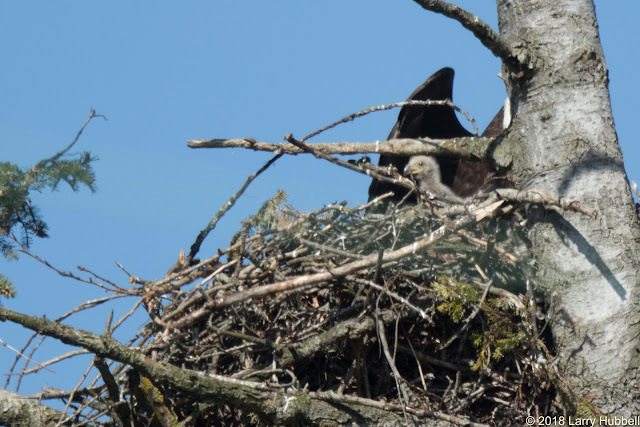 The best moment of the week was when Eva held up her wing behind the eaglet. I have seen hawks and osprey use their wings to mantle their food e.g. hide it from competitors, and once, from a great distance, I watched an eagle mantle her young. In this case, I cannot be positive what Eva was doing. I did not see any danger in the sky, and she was obviously not shielding the eaglet from the sun. However, when I reviewed the timestamps on my photos I found she held her wing in this position for 17 seconds. That makes me think the effort was intentional. 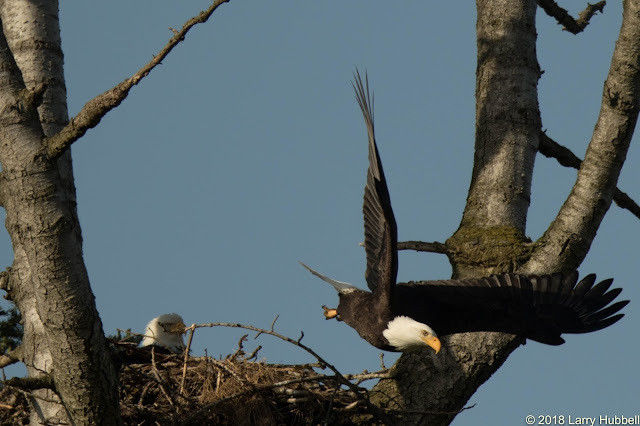 I do believe Eva was attempting to protect her eaglet. 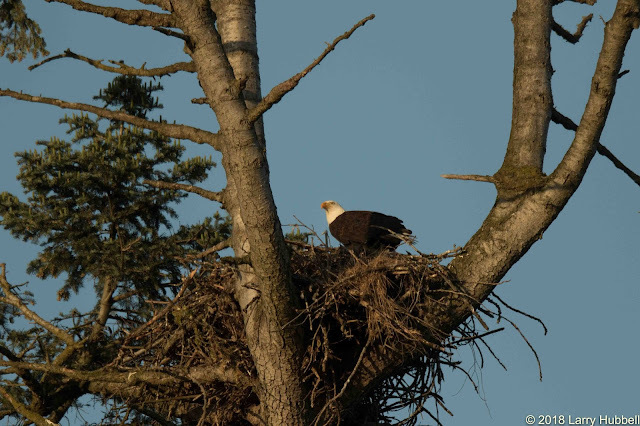 (By the way, this morning I saw a second eaglet in the nest.) Especially for the first few weeks the young need protection. Their innocence and small size make them vulnerable. The adults' experience, knowledge and physical capabilities make them the highly capable parents. Even so, the next couple of months will be challenging for them as they strive to find enough food to feed their young. If all goes as expected, by the end of July these little eaglets will be larger than their parents! 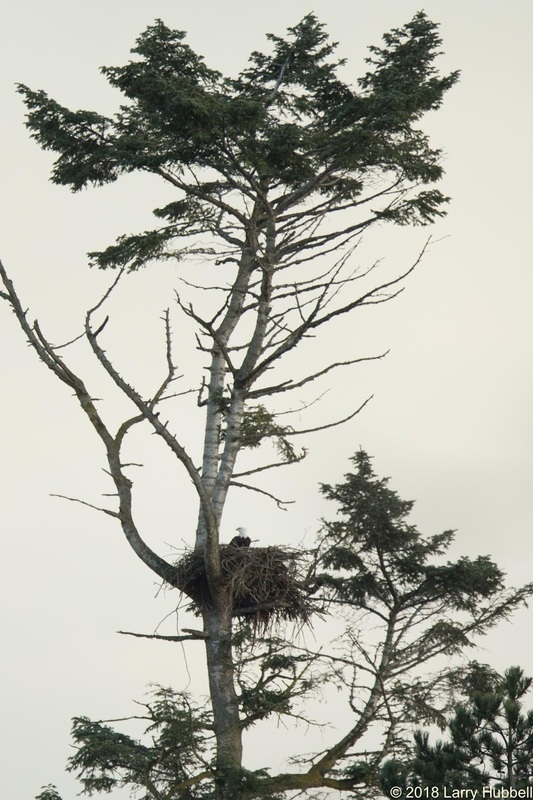 Have a great day on Union Bay...where eaglets hatch in the city! What species of plant is this? Is it native to Union Bay? 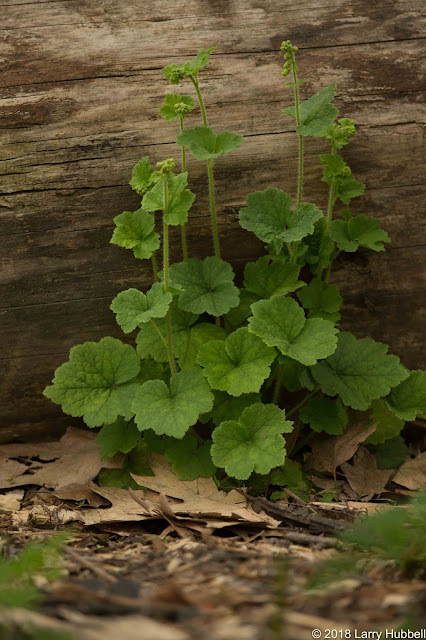 Fringe Cup: Is a native plant to Union Bay. I see it often in somewhat disturbed areas next to trails in the Arboretum. Click on the green link to learn more. Thank you so much for this post, Larry! It gives us a great chance to get close to these neighbors without disturbing them. I'm looking forward to the growth of the new little ones!